In Robin Hood - The Legend of Sherwood you get to take part in one of the oldest and still most popular stories of all. Only a hair's breadth from the action, you share in all the excitement and adventures of your heroes: Robin Hood, Little John, Will Scarlet, Stutely the Owl, Friar Tuck and the lovely Lady Marian. You can penetrate the mighty walls of Nottingham Castle, York, Leicester, Derby and Lincoln, and attack heavily guarded convoys in Sherwood Forest. The Prince's lightly-armed guardsmen and heavily armored knights will challenge you to a duel on staircases lit by flaming torches. Or they might try and fool you with beer, hornets' nests or a well-aimed money-pouch. Whenever you want, you can go to the outlaws' camp and practice the basic and advanced game functions; whether hand-to-hand combat with swords or staffs, target practice with the bow or the skilful use of the many implements Robin's followers have at their disposal. Easy mouse control and a system of icons you can understand intuitively will aid both beginners and experts in getting into the game quickly and helping you towards your first successful results. Movements and battles can be controlled problem-free using the mouse. 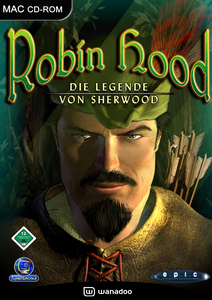 The Robin Hood - The Legend Of Sherwood battle system enables you to have exciting duels with swords, staffs and other typical mediaeval weapons. But in the end it is having the right tactics which decides on victory or defeat. Whether you sneak into a castle and avoid the sentries or whether you take the direct route with sword and bow, is up to you. For example you can use the reduced visibility during the hours of darkness to your advantage. Or you can deploy the numerous abilities and special objects your men have, in order to distract the Prince's henchmen. Or then again you could try to fight your way through to your goal using well-aimed bowshots and skillfully deployed weapons. A lot of different possibilities present themselves; you just need to use them wisely.